"Foodie Friday" returns (a little late in the afternoon) with something mouth-watering. 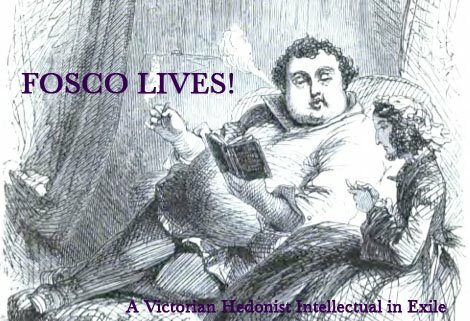 The first week of April brought Fosco's friend Todd on his annual pilgrimage to the Bay Area. You may not know that, in recent years, Todd has become something of a BBQ expert. 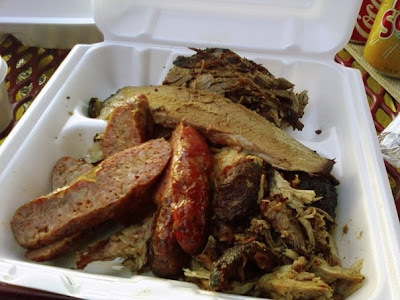 Because of his travels around this country (and a group of very food-obsessed friends), Todd pretty much has recommendations for good BBQ in almost any major American city. I never travel without asking Todd if there is a good BBQ place to visit at my destination. Todd was particularly excited this visit, as he finally had a lead on some good Bay Area BBQ. 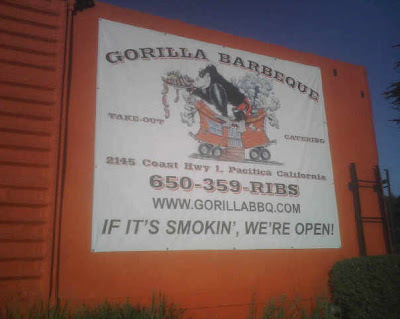 And so we drove to the small town of Pacifica, just south of San Francisco along the coast, to find Gorilla BBQ. 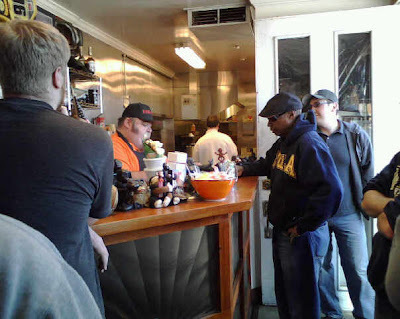 Gorilla BBQ turns out to be notable for several reasons. 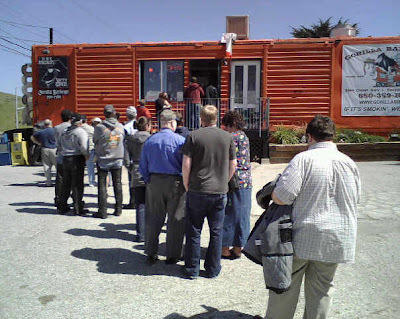 First off, there is its location in a bright-orange boxcar. Second, there is its theme song (listen to it at the website). Third, there is the fact that the owners spent $26,000 on a smoker. 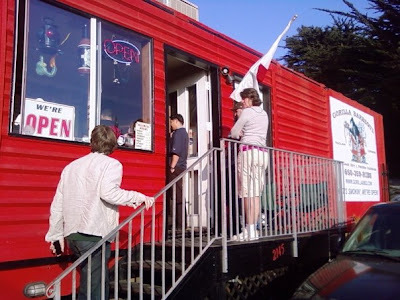 Fourth, the place recently appeared on punk bear Guy Fieri's "Diners, Drive-ins, and Dives" on Food Network. And perhaps most interesting: one of the co-owners has the words "PORK" and "RIBS" tattooed on his knuckles. Indeed! Let's check out the setup. 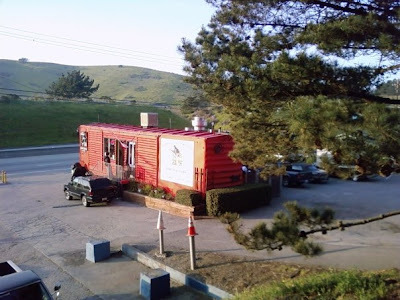 This is boxcar (and over that hill is the ocean--that's Highway 1 right there). The sign is perhaps slightly misleading, as I have yet to see much smoke coming from the place. Too much smoke is probably against local environmental restrictions anyway. 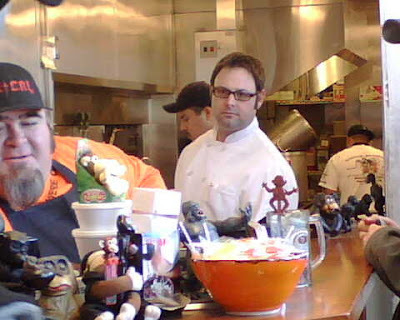 This is Jeff, one of the co-owners (and apparently the primary chef). 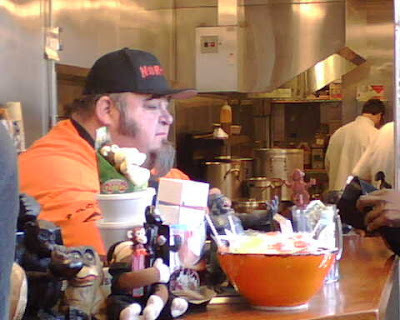 Notice all of the monkey tchotchkes on the counter. This is Rich (aka "Gorilla"). He's the one with the tattooed knuckles. He takes the orders. As you can see, there isn't much space in the boxcar to run the whole operation. Of course, it's takeout only. The pulled pork is fine. The hot links are spicily delicious. 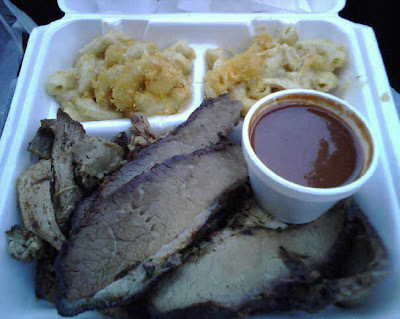 The brisket is EXTRAORDINARY--crusty, smoky, tender, cut-able with a spork (yes, a spork is what they provide you to eat with...). The BBQ sauce (appropriately served on the side) is tart and wonderful--best I've had outside a hundred-mile radius of Memphis. One thing I liked: the attention to the sides, which were pretty much all delicious. The Mac N Cheese is absolutely awesome, and the corn muffins are the Platonic ideal of corn muffins--best I've EVER had. Seriously. Sure, it may have taken half an hour to get to the counter. But it was worth it. 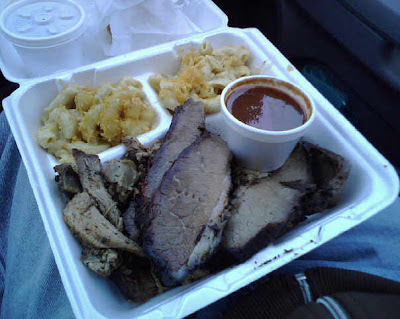 Brisket! Of course, Gorilla may not compete with the best of Memphis (or Texas and North Carolina, for that matter), but I suspect it's the best in Northern California--and that's not too shabby. If you are ever within 50 miles of this place, it is worth a trip. I could go for some ribs and hot links right about now. Can you pick some up for me and drop it off at FedEx? Why not, right? You need a spork? The correct answer to that question is always, always, "Yes. Yes I do." My verification word: pubedef. I have the screenshot to prove it. I don't have anything noted in Baltimore proper, but Andy Nelson's in Cockeysville is pretty good, and Smokey Hollow in Laurel has been recommended to me. As for the D.C. area, Willard's in Chantilly, VA is good, but the real gem is KQB in Bowie, MD. Thanks Todd! You're amazing, and I shouldn't be surprised. I'm intrigued by the "Swine Social Club" on Andy Nelson's website -- so I'll definitely check it out next time I head up there. About KQB I find nothing at all online, which is, I suspect, a good sign.